I'm currently doing a small experiment with the ADCs, fluidized them, harden them up, and so on. I also experiment on my own sand clay recipes too! :) But there will not be any new item from the experiment to show here yet. I'll have to wait until next weekend to be able to 'play' again. OK, now let's talk about ADC tips. You know that ADC dry up when it exposes to air. However, they clay drying rate also increase once you mix the color to the clay. It doesn't matter how tight you seal your bag, it dries. I think it's kind of chemical reaction between the clay and color compositions which speed up the drying process. But this doesn't mean the clay will dry in a heart beat. I mean, normally you may keep the clay for months while the colorized clay will only last for a few weeks. So, it's good to make a plan on making things and amount of clay to be colorized for each use. Clay and tools, with Fimo and other PC. Once it comes to time you play with tools, you will need cornstarch or talcum powder to powder/coat you tools to prevent the stickiness and gluing effect between the clay and tools. What about ADC? It's not much different. 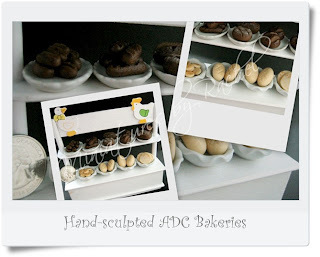 With ADC you can also use talc or cornstarch or dense/rich hand cream - in many CP recipes/tutorials the suggestion is cold cream. OK, something else other than regular cream cake, marble cake! 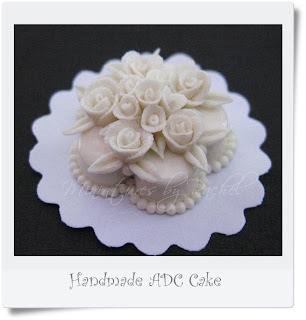 :) The cake is made of Thai Clay while the flowers are from Japanese Luna clay. I managed to get the stripes of cream and chocolate part. 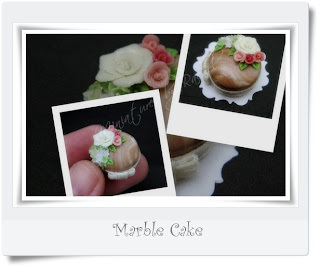 Yes, beside marble sponge cake this one is marble cream cake! :D Well, it was fun trying this and that and even better when the result come out quite nicely. Making miniatures with ADC is a great chance to learn, adapt, adopt, invent, adjust and play with techniques and the materials. I intend to do scratch, sculpt, knead and twist, etc. techniques rather than moldings. Seeing ancient handmade items with delicate details inspire me a lot. If they can with a lot less and very limited tools, why can't I? I've been 'playing' with ADC for quite a while with a couple different 'brand' or whatever so called. As ADC comes in translucent white (rarely come in white) therefore, once you would like to make the clay into something you need to add color to it. You can use almost (I said almost because I did not try all type of the color available yet) artist color: water color, poster color, oil color, acrylic color, etc. Just add them into the clay and knead the mixtures to get even color. Water and poster color give pastel tone of color while acrylic and oil color give you stronger color. However, it's depend on the way you mix the color. If you are familiar with color and painting, I'm sure you can make it out whatever you want. I, finally, finished my bakery house! :D It's so fun with all these 'clay play'! 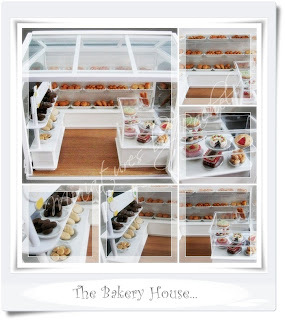 Hehehe :D I guessed you see that I've a new obsession, breads and buns. 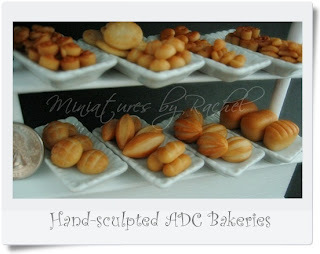 In all I almost get stuff for a bakery shop done, and they are all made of ADC. :) This time it's black and white breads scene. I couldn't get all names yet though... Any suggestion? 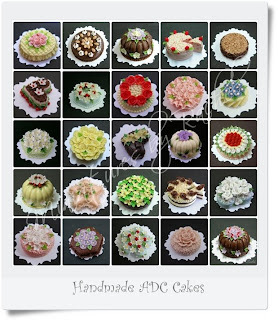 For ADC there are 'homemade' recipes available online together with the recipe cooking how-to. If you compare home made cornstarch clay to cold porcelain recipe you will see the similarity. 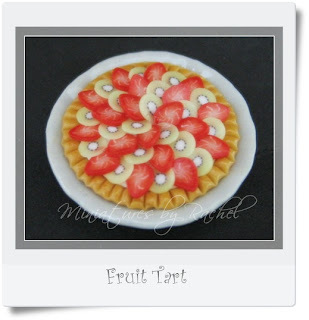 The main ingredients are cornstarch and water and then other ingredients are added. With cornstarch/flour you need to cook the recipe, but with substitute of kaolin or talcum no cooking needed - so they say some homemade Luna clay recipes use these substances. And there are many more interesting recipe online! 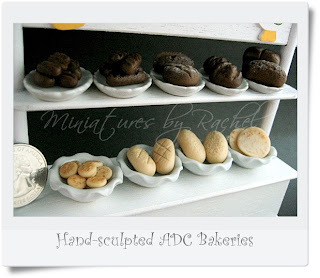 I'm addicted and became obsessed on making minis using ADC, not the one I made by myself, but the clay on my current experiment is local made not a manufacturer/brand one and it's quite easy to work with. More or less similar to my regular clay. There are several different type of clay used for miniatures and sculptures. 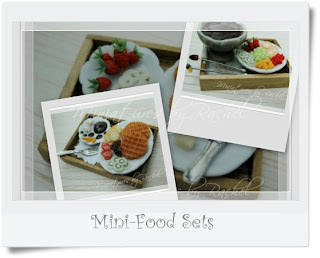 For miniature food, you may familiar with Polymer Clay like Fimo which is also known as oven or bake clay which needs to be baked in oven to get its final properties. 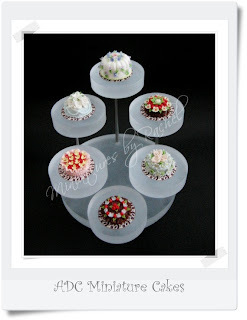 Cold porcelain is well known for realistic look flower making and it's a kind of clay that do not need to be baked to make it hard and fully 'set' when it dried. I started my mini-making using ADC, Japanese ADC known as Pando or Pan Clay and Cosmos and also work with Fimo from time to time. Later on I use Luna Clay which is also ADC. The properties of these clay are not much different. I don't know what exactly the ingredients of these clay are. But from internet searchings, information exchanging with several other crafters and sculptures brought me to my conclusion that cold porcelain and the ADC I use are quite similar they all started from homemade bread dough then, develop the recipe for better properties especially, to prevent disturbance from insects and molds. There are pros and cons on each and every clay and that once you decide to 'play' with it you may need to do some experiments to get used to its properties. Hello and welcome to my blog! I'm Rachel, a miniature lover who started out from collecting and end up making her own dollhouse size miniatures in various scale using Cold Porcelain and Japanese Luna clay. Please make yourself at home, sit back, relax and have fun browsing!